Have you ever tried to tune an engine only to find it won't idle or run right? Or have you ever been confronted with an engine that just doesn't seem to run right no matter what you've done or replaced? You may be dealing with an engine vacuum leak. Sometimes a vacuum leak will whistle or hiss and make itself obvious. But oftentimes, a vacuum leak will disguise itself as an ignition or fuel problem that defies diagnosis. Either way, an engine vacuum leak is bad news because allows "unmetered" air to enter the engine and upset the air/fuel ratio. Too fast an idle speed. If an engine without computerized idle speed control is idling too fast and refuses to come down to a normal idle speed despite your best efforts to back off the carburetor idle speed screw or air bypass adjustment screw (fuel injection), air is getting past the throttle somewhere. Common leak paths include the carburetor and throttle body gaskets, carburetor insulator spacers, intake manifold gaskets, and of course, any of the engine's vacuum fittings, hoses and accessories. It is even possible that leaky O-rings around the fuel injectors are allowing air to leak past the seals. Another overlooked item can be a worn throttle shaft. A rough idle or stalling. A performance cam with lots of valve overlap can give an engine a lopping idle, but so can a vacuum leak. A really serious leak can lean the air/fuel mixture out to such an extent that an engine won't idle at all. An EGR valve that is stuck open at idle can have the same effect as a vacuum leak. So too can the wrong PCV valve (one that flows too much air for the application), or a loose PCV hose. The rough idle in these cases is caused by "lean misfire." The fuel mixture is too lean to ignite reliably so it often misfires and fails to ignite at all. Lean misfire will show up as elevated hydrocarbon (HC) readings in the exhaust, enough, in fact, to cause a vehicle to fail an emissions test. Hesitation or misfiring when accelerating. This may be due to a vacuum leak, but it can also be caused by a weak or inoperative accelerator pump in a carburetor, dirty injectors, or even ignition problems such as a cracked coil, worn spark plugs or incorrectly gapped plugs. An idle mixture that defies adjustment. When setting the idle mixture adjustment screws on a carburetor, the idle speed should start to falter as the adjustment screws are turned in to lean out the mixture. If the screws seem to have little or no effect on idle, you have either got a carburetor problem or a vacuum leak. The important thing to keep in mind about vacuum leaks is that they have the most noticeable effect at idle. At part and full throttle, there is so much air entering the engine that a little extra air from a vacuum leak has a negligible effect. TIP: If you have a scan tool, look at the Short Term Fuel Trim (STFT) and Long Term Fuel Trim (LTFT) values. Normal range is plus or minus 8. If the numbers are +10 or higher for STFT and LTFT, the engine is running LEAN. If you rev the engine to 1500 to 2000 rpm and hold it for a minute or so, and the STFT value drops back down to a more normal reading, it confirms the engine has a vacuum leak at idle. If the STFT value does not change much, the lean fuel condition is more likely a fuel delivery problem (weak fuel pump, restricted fuel filter, dirty fuel injectors or a leaky fuel pressure regulator) than a vacuum leak. For more information about using fuel trim to diagnose a lean fuel condition, see What Is Fuel Trim?, or view this article on Fuel Trim by Wells Manufacturing (PDF file). Before we get into the various techniques of finding and fixing vacuum leaks, let's quickly review vacuum's role in fuel delivery. Intake vacuum exists in the intake manifold as a result of the pumping action of the engine's pistons and the restriction created by the throttle valve. Were it not for the throttle choking off the flow of air into the engine, there would be little if any vacuum in the intake manifold (like a diesel). The downside of intake vacuum is that it creates pumping losses and reduces engine efficiency. On older carbureted engines, vacuum is needed to pull fuel into the engine. Vacuum siphons fuel through the idle, main metering and power circuits. An engine with a vacuum leak, therefore, will likely be an engine that suffers from the symptoms of lean carburetion such as lean misfire, hesitation, stalling and rough idle. But the same symptoms can also be caused by a clogged catalytic converter or other exhaust restriction, a leaky EGR valve or valve timing problems (all of which reduce intake vacuum). Engines with Multiport Fuel Injection and Gasoline Direct Injection don't need vacuum to pull fuel into the engine because it is sprayed in under pressure. Even so, most of these engines still have a throttle for regulating airflow and engine speed. And like the older carbureted engines, a throttle body also creates an airflow restriction that creates vacuum inside the intake manifold. On most engines, intake vacuum should be steady between 16 and 22 inches Hg (Mercury). A lower reading usually indicates a vacuum leak, or one of the other problems just mentioned. A reading that gradually drops while the engine is idling almost always points to an exhaust restriction. An oscillating vacuum reading usually indicates a leaky valve or badly worn valve guides that leak vacuum. Although fuel injected engines do not rely on intake vacuum to pull fuelinto the engine, vacuum leaks can upset the carefully balanced air/fuel ratio by allowing "unmetered" air to enter the engine. The result is the same kind of driveability symptoms as a vacuum leak on a carbureted engine (lean misfire, hesitation when accelerating, rough idle and possibly even stalling). Common leak points include injector O-rings, intake manifold gaskets, idle air control circuit and the throttle shaft. Fuel injected engines also rely on intake vacuum to regulate the fuel pressure behind the injectors. Fuel delivery cannot be accurately metered unless a fairly constant pressure differential is maintained. So the fuel pressure regulator diaphragm is connected to a source of intake vacuum. Vacuum working against a spring-loaded diaphragm inside the regulator opens a bypass that shunts fuel back to the tank through a return line. This causes the fuel pressure in the injector rail to rise when engine load increases (and vacuum drops). 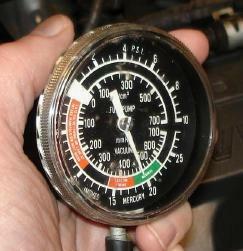 Thus, the regulator uses vacuum to maintain fuel pressure and the correct air/fuel ratio. A vacuum leak changes the equation by causing a drop in vacuum and a corresponding increase in line pressure. Vacuum is measured with a vacuum gauge. Most are calibrated in inches Hg (Mercury), but you may also see some gauges that are also calibrated in inches of H20 (water) or kilopascals (kPa) or even bars. One inch of vacuum measured in inches Hg equals 13.570 inches in H20, 0.4898 psi (pounds per square inch) or 3.377 kPa. Okay, now that we have covered what a vacuum leaks do, how do you find components that leak vacuum? One way is to visually inspect all the vacuum hoses and connections. Look for disconnected, loose or cracked hoses, broken fittings, etc. Hey, you might get lucky and find the problem in a few minutes, or you might waste half the day trying to find the mysterious leak. Vacuum leaks are often the elusive needle in a haystack. And if it is not a hose leaking vacuum but something else such as a gasket, worn throttle shaft, injector O-rings, etc., you may never find it using this technique. A faster technique for finding intake manifold vacuum leaks is to get a bottle of propane and attach a length of rubber hose to the gas valve. Open the valve so you have a steady flow of gas. Then hold the hose near suspected leak points while the engine is idling. If there is a leak, propane will be siphoned in through the leak. The resulting "correction" in the engine's air/fuel ratio should cause a noticeable change in idle speed and/or smoothness (Note: on engines with computerized idle speed control, disconnect the idle speed control motor first). Aerosol carburetor cleaner can also be used the same way. CAUTION: Solvent is extremely flammable, so do not smoke or use it if there are any sparks in the vicinity (arcing plug wires, for example). Spray the solvent on suspected leak points while the engine is idling. If there is a leak, the solvent will be drawn into the engine and have the same effect as the propane. The idle speed will suddenly change and smooth out. TIP: If you have a scan tool, look at the Short Term Fuel Trim (STFT) value while you are using carb cleaner or propane to check suspected vacuum leak points. If there is a leak and some of the cleaner or propane is sucked in through the leak, you will see a momentary drop in the STFT reading. This confirms you have found a leak (keep checking because there may be multiple leaks!). A smoke machine with UV dye can reveal tiny vacuum leaks. Low pressure smoke is fed into the intake manifold, then you look for the telltale dye to find the leak. A much safer technique is to use a smoke machine. These machines feed artificial smoke into the intake manifold, The smoke may also be mixed with an ultraviolet dye to make leaks easier to see. You then look for smoke seeping out of hoses, gaskets or cracks in the manifold and/or use a UV light to find the leak. This type of equipment is often needed to find small air leaks in the EVAP (evaporative emissions) control system. Smoke machines can cost $600 to $2000 or more depending on the model and features, so they are primarily for use by professional technicians. Propane can also be used in conjunction with an exhaust analyzer (do NOT use carburetor cleaner or you may damage your analyzer!). Engine vacuum leaks almost always cause fluctuating HC readings, so an infrared exhaust analyzer can (1) tell you if there is indeed a leak, and (2) where the leak is using the propane procedure. Two types of vacuum leaks can be diagnosed with an analyzer. The first kind is a general vacuum leak (PCV hose, brake booster, etc.) that leans out the mixture and causes a very low CO reading and only a slightly higher fluctuating HC reading. The O2 reading will also be high. The second kind of vacuum leak is a "point" leak that affects only one or two cylinders (a leaky manifold gasket or a crack or porosity leak in one of the manifold runners). This will be indicated by a normal or low CO reading combined with high fluctuating HC readings. O2 will again be high. To find a leak, feed propane at suspected leak points until you note an improvement in idle quality and/or a change in the HC/CO/O2 readings. When you have found the leak, the idle should smooth out, HC and O2 should drop and CO rise. It is important to note that an overly lean idle mixture will also cause a fluctuating HC reading the same as a vacuum leak. To tell one from the other, there is a simple "trick" you can use. Momentarily enrich the idle mixture to 1.5 to 2.0% CO by placing a clean shop rag over the top of the carburetor. If the engine smooths out and HC drops and remains stable, the problem is a lean idle mixture adjustment. If HC still fluctuates, however, the engine is still too lean in one or more cylinders indicating a vacuum leak. If you like gadgets, there are electronic tools designed to detect vacuum leaks. An electronic vacuum leak detector will beep or flash when it detects ultrasonic vibrations that are characteristic of a vacuum leak. These tools use a sensitive microphone to listen for certain noise frequencies. Though extremely sensitive, these tools sometimes react to tiny leaks that are not really causing a problem, or "false" leaks such as the noise created by arcing inside the distributor cap or normal bearing noise in the alternator. Another way to find an elusive vacuum leak is to pressurize the intake manifold with about three lbs. of regulated air. This can be done by attaching a regulator to your shop air hose, then attaching the hose to a vacuum fitting or the PCV valve fitting on the intake manifold, carburetor or throttle body. Do not apply too much pressure or you may create new leaks! With the engine off and air flowing into the manifold, spray soapy water on suspected leaks. If you see bubbles, you have found the leak. You can also use the opposite technique, which is to apply vacuum with a hand-pump to various vacuum hoses and circuits to see if they hold vacuum. But this technique means tracing the entire circuit to see where it ends, and disconnecting and plugging any parts of the circuit that do not "dead end" against a diaphragm or valve. * Leaky vacuum hoses Replace them. If the end of a hose is loose or cracked, cutting it off and sticking it back on may temporarily eliminate the leak. But if the hose is rotten or age hardened, it needs to be replaced. Shortening hoses may also create additional problems. The hose may chaff or rub against other components, or pull loose as a result of engine motion and vibration. Use the correct type of replacement hose (PVC hose or vacuum hose capable of withstanding fuel vapors and vacuum without collapsing). Also, be sure the replacement hose is the same diameter and length as the original. * Carburetor or throttle body base gasket vacuum leaks Try tightening down the carburetor or throttle body mounting bolts. If that doesn't stop the leak, replace the gasket under the carburetor or throttle body. If there is a heat insulator or adapter plate under the unit, it may also have to be replaced depending on its condition. While the carburetor or throttle body is off, use a straightedge to check the base for flatness (and the manifold, too). Warped surfaces can prevent a tight seal, so if you find any it calls for resurfacing or component replacement. * Carburetor or throttle body throttle shaft vacuum leaks Wear here can only be repaired by resleeving the throttle shaft, which for all practical purposes means replacing the carburetor or throttle body with a new or remanufactured unit. * Intake manifold gasket vacuum leaks Try retorquing the intake manifold bolts, working from the center out in the recommended tightening sequence. If that fails, the intake manifold will have to be removed and the intake gaskets replaced. Sometimes the mating surface of the intake manifold or the heads will not be flat (check both with a straightedge). If warped, the intake manifold and/or heads will have to be resurfaced on a milling machine. Another problem to watch out for here are heads that have been milled or resurfaced to raise compression. To maintain proper alignment between the manifold and heads, metal also needs to be machined off the bottom of the manifold where it mates with the block, otherwise it will sit to high and the ports and bolt holes won't align. * EGR valve leaks If the valve isn't closing all the way due to carbon deposits on the stem or valve seat, cleaning may be all that is needed to cure the problem. Otherwise, the engine will need a new EGR valve. * Leaky power brake booster Replace it. But first make sure it is the booster and not just the hose or check valve that is leaking.